Big harvests got underway this week. All the shallots came out of the ground on Wednesday, along with nearly half of the onions. When asked what my favorite vegetable is, shallot is usually my response. They’re like magic onions — use them in place of an onion, and magically your food tastes even better! We laid them out to cure on racks in the upstairs of our small barn, with a fan trained on them for air circulation. As for the onions that we’ve pulled so far, they look great. 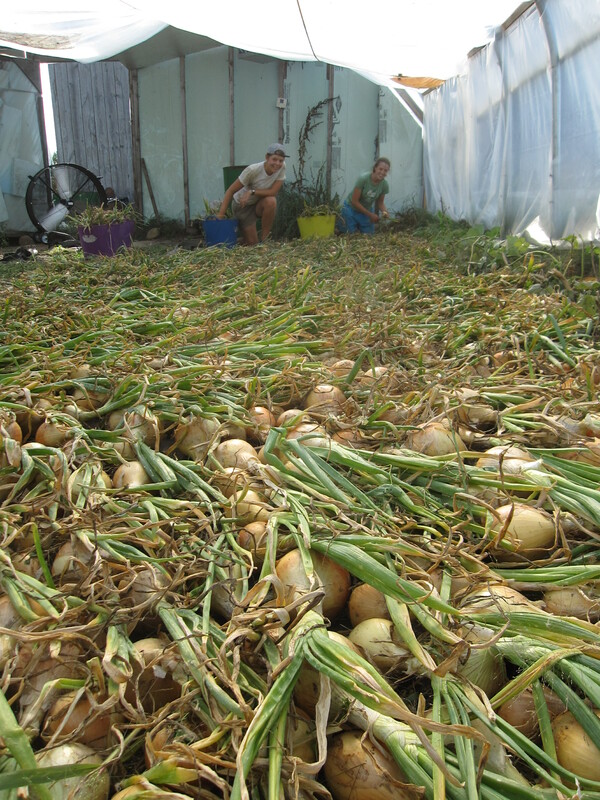 We lay them in one layer on the floor of the greenhouse, the tops of one onion covering the bulb of the next onion over. This way they can dry out slowly and avoid sun scald. Faith and Tiff in the greenhouse, afloat on a sea of onions. The next big harvest (nearly half of the day on Friday) were the husk cherries. Husk cherries tend to be something that people either love or hate. Pop them out of their (inedible) paper lantern skins into your mouth. They’re related to the tomatillo, but are sweeter and give an extremely satisfying ‘pop’ when gently bitten! Finally, the grand finale… sweet corn! We harvest the corn right before the CSA pick-up so that it reaches you at the peak of sweetness. The longer time the ear is off the stalk, the more time the sugars in the corn have to turn to starch. So in order to enjoy the corn at its sweetest, eat it as soon as possible! Thanksgiving may still seem a world away, but Cheryl at Terra Optima Farm is taking reservations for her farm-raised turkeys. The price is $3.25/lb (minus the $25 deposit). Contact her directly (cheryldenz5@gmail.com) for more details or to reserve your bird! We hope you have a wonderful week full of memorable meals!